Sometimes a story comes along at just the right time and whispers in your ear, in a voice that is both familiar and entirely new. 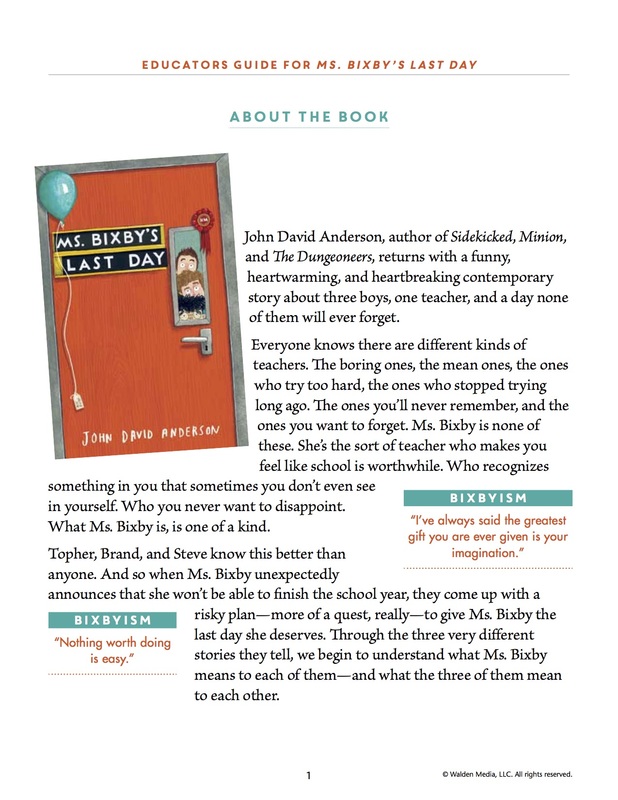 John David Anderson’s Ms. Bixby’s Last Day is that kind of story. Told in three alternating viewpoints, Anderson’s novel explores the relationships between three boys—Brand, Steven, and Topher—and their sixth-grade teacher Ms. Bixby. The boys and their pursuit of the ingredients for The Perfect Day lead us through a 24-hour escapade that is both hilarious and deeply moving. In celebration of MS. BIXBY, we’re releasing a weeklong series of posts, beginning with this roundup of multimedia to help you go beyond the book. 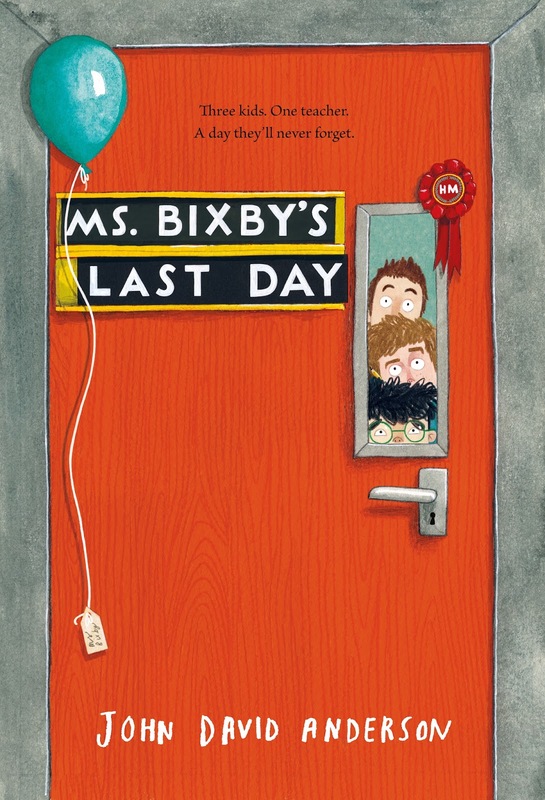 Don’t have a copy of Ms. Bixby’s Last Day yet? How about a sneak peak? Read the first 46 pages by clicking on the image of the dedication below. TO ALL THE MS. BIXBYS. And everyone else who sees it through, no matter what. 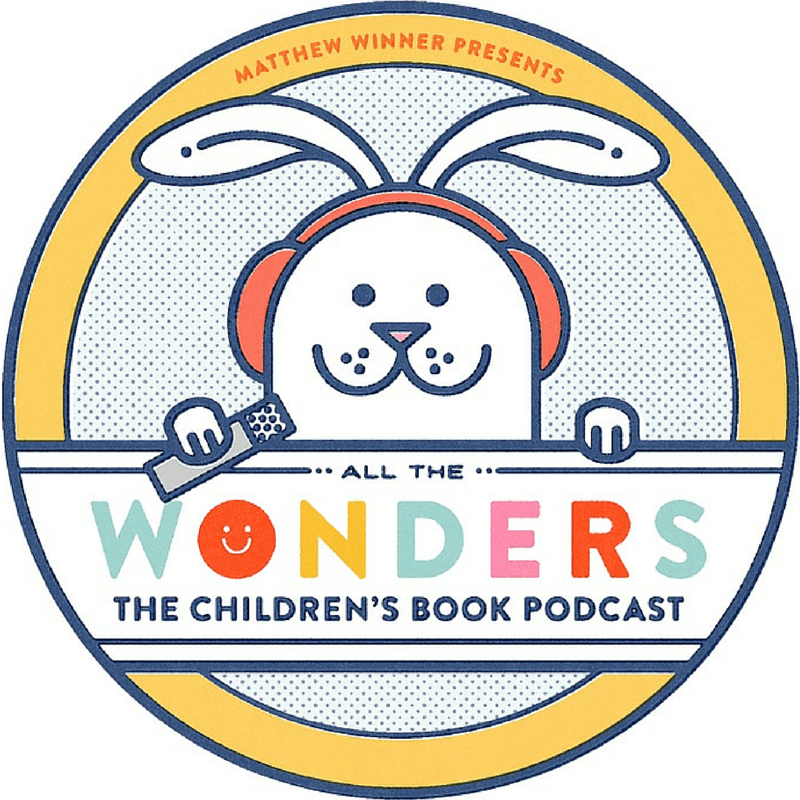 Author, John David Anderson (@anderson_author), stopped by the All The Wonders podcast to talk about trying to find the hero of the story, the shared narrative that exists among any group of friends, and the presence of Obi Wan Kenobi teachers. 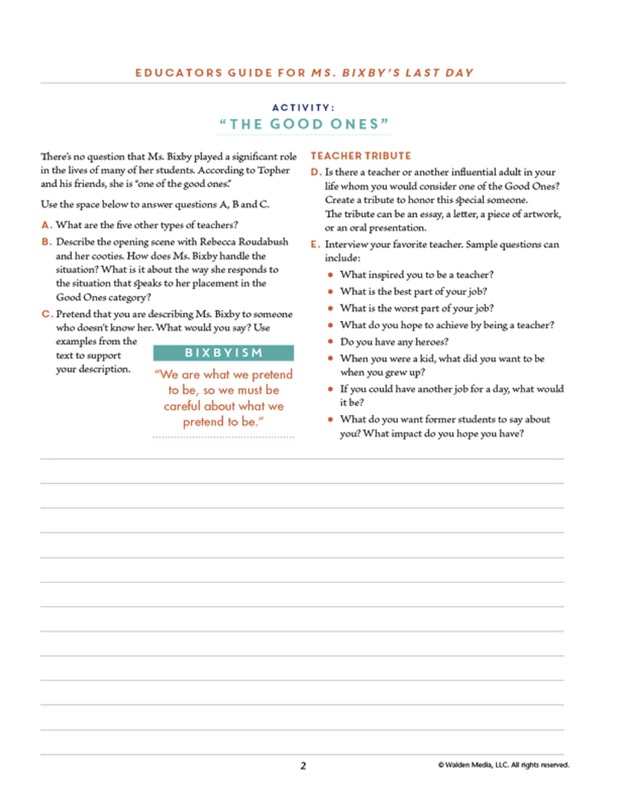 Have you ever had a favorite teacher? Maybe someone as AWESOME as Ms. Bixby? Follow along as Mike & Julian of Walden TV share their list of favorite teachers, both real and fictional! 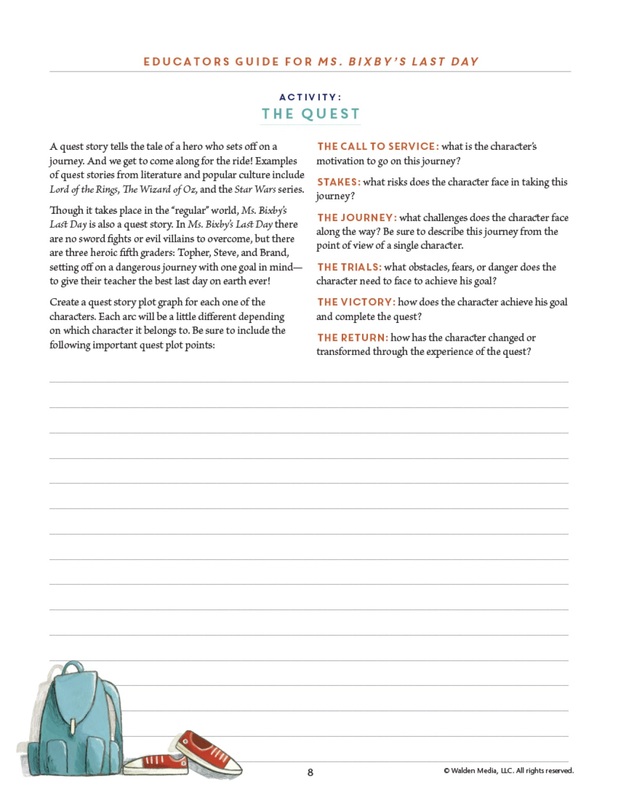 Here are some MS. BIXBY-inspired activities that readers of all ages can try, courtesy of Walden TV. Click the images to download. 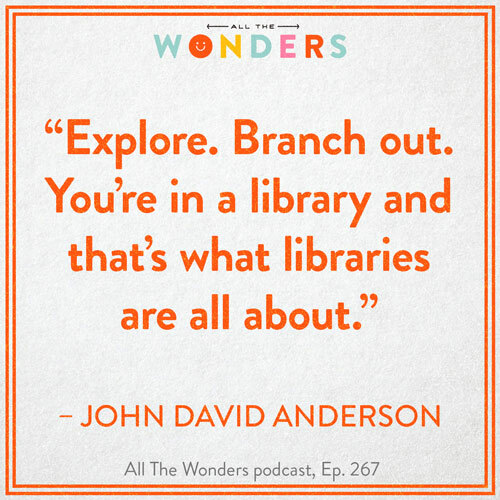 Share this quote on libraries from MS. BIXBY author, John David Anderson, as heard on the All The Wonders Podcast, episode 267 (Listen above). To download, right click on the image and save to your desktop. Be sure to check out the rest of our Week of Ms. Bixby’s Last Day here at All The Wonders. You’ll find a post on the true meaning of “Carnation Days” by Jess Townes, a reflection on teachers and their stories by Hannah Barnaby, and finally, a very special, exclusive post from author John David Anderson and editor Jordan Brown! Get your copy of Ms. Bixby’s Last Day and John David Anderson’s other books here. I love this book and am recommending it to all my teacher friends. I’m in the process of getting a classroom set thanks to Gear-Up and Ms. Garr.